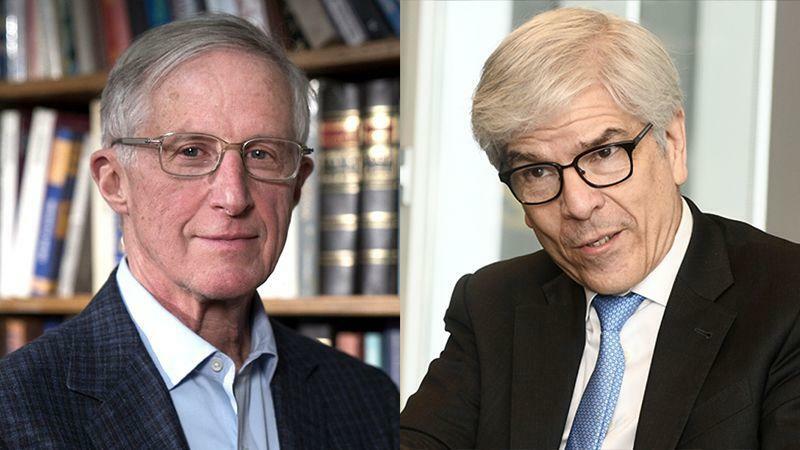 The 2018 Nobel Memorial Prize in Economic Science was awarded for the 50th time today, to William D. Nordhaus of Yale University and Paul M. Romer of New York University. Although Austrian school economists might find common ground on a few aspects of Nordhaus and Romer’s work, such as Romer’s criticism of “mathiness” in economics, there is not much for Austrians to celebrate about this year’s prize. Both economists see an expanded role for the State. Romer is known for his suggestions that government invest in research and development and employ patent laws to foster economic growth. Nordhaus believes that government should act to prevent adverse changes in climate. He is not a zero-carbon-growth fanatic - he has argued against a policy that would stop global warming entirely, saying that allowing up to a 2.3 degrees C global temperature increase would be optimal, given the costs that climate policy would entail. And Nordhaus has rightly criticized some climate studies for their use of inappropriate discounting over time. But Nordhaus, avocal critic of skepticism on global warming science , and has argued for global, universally imposed carbon taxes as a centerpiece of his recommendations on climate policy. Carbon taxes and quantitative restrictions on carbon emissions (e.g., “cap and trade”) both start with problematic assumptions. An emissions tax assumes, among other things, that the government can know what the gap is between the marginal cost of a production process to the pollution emitters, and the marginal cost of the production process to everyone else. The tax would be imposed to span this gap and induce polluters to rein in their pollution to the optimal level. Since the economy does not stand still for economists, the gap would constantly change - and therefore the appropriate tax. Similarly, a quantitative cap on emissions assumes that the government can know the quantity of pollution where the marginal costs to everyone equal the marginal benefits to everyone (“benefits” of pollution being mainly the products of the activity that generates the pollution). Rather than intervening by changing the price with a tax, the government would intervene by dictating the quantity of pollution. With “cap and trade” policy, government would create permits for the pollutant and allow those emitters which find it expensive to reduce emissions to buy permits from those who find it cheap to do so. It is a market mechanism, but one which begins with the untenable assumption that the government knows how many permits should be in the market. And with phenomena like climate change that have benefits and costs over a very long period of time, that knowledge would have to include some remarkable foresight. To be sure, both avoid the shortsighted and likely more costly approach of having government dictate the specific emissions-reduction technologies that should be used, or encourage one control technology over another with subsidies. But Nordhaus has also suggested government support of greenhouse gas-reducing technologies, arguing that free markets would underinvest in technologies with positive externalities. And he has suggested policies that he believes will create benefits to society apart from climate benefits, such as subsidies of urban tree-planting. The thinking is that tree-planting might be an effective carbon repository - and who doesn’t like more trees in among the concrete and steel of an urban center? These policies are called “no regret” policies, but we run into the same knowledge problem again. How can we know that the resources expended in planting trees could not have been used in some other way that would have produced an even greater benefit to human life? By directing resources according to a politically determined plan rather than the decentralized ordering of the marketplace, the information provided by a price system is discarded. The priorities of free individuals fall by the wayside, replaced by what political figures imagine to be optimal. More urban trees might mean less money for vacations, less money for education, fewer resources for cancer research, and/or less adaptation to climate change. “No regret” policies could easily turn out to be policies we should regret very much. Even if we were to assume away these immense problems, environmental policy is not out of the woods. If we were to devise a way for accurate scientific data and the information of the free marketplace to somehow be gathered and communicated instantaneously to the policymakers (along with continual updates), we could have no confidence that the policies would not become a tool of the policymakers’ ambitions - and the ambitions of the politically well-connected. Replacing individual priorities with what policymakers believe is optimal for society might be far too optimistic, as it turns out. How can we be sure that environmental policy would not be used to promote re-election or a bureaucratic empire rather than climate improvement? Would a carbon tax really not be set higher than what is optimal so as to enrich industries that compete with coal or oil? Could a subsidy or regulatory mandate accelerating the adoption of energy-efficient light bulbs be a tactic used by some firms to improve profits and avoid loss of market share ? Finally, as Murray Rothbard has pointed out in his essay “Law, Property Rights and Air Pollution,” the goal of efficiency is itself an ethical norm which is imported into policy proposals, often without comment or justification. In asserting that property rights should be abridged or transferred in the search for efficiency, economists like Nordhaus condemn ethical systems based on human liberty. Why should efficiency - however that is conceived - supplant liberty, and why should externalities be internalized above all other considerations? Rothbard asks. But free markets have been among the most powerful forces for cleaner technology and new ideas. Innovation, wealth creation, and healthier people are to be found among the most economically free parts of the world. Unfortunately, the economics Nobel this year neglects the problems at the heart of the State - the government failures that pollute and impoverish.